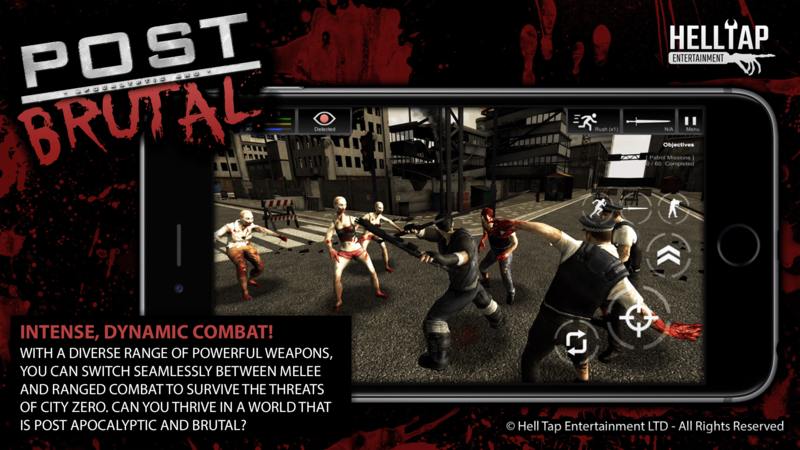 [prMac.com] London, United Kingdom - Hell Tap Entertainment LTD is pleased to announce its upcoming debut game, Post Brutal, soon to be released for iOS and Android platforms. Post Brutal is an ultraviolent 3D action RPG set in a ruined and war torn city under quarantine. In the aftermath of 'The Event', over half of City Zero's population have been driven into a feral frenzy. Players take the role of a post-apocalyptic survivor as themselves; using their mobile device camera and microphone, players can give their character their own face and record dialogue for in game conversations with other survivors, making this zombie apocalypse truly personal. "One of my favourite aspects of an RPG is being able to create myself as the protagonist", said Mel Georgiou, Director of Hell Tap Entertainment LTD. "What better way to feel invested in your character than by giving them your own face and voice?" Blood splatters and limbs fly as players master intense melee and frenetic ranged combat with a range of weapons that spans household items to military hardware and near future technology. A diverse set of skills are available including Adrenaline Rush, which slows time, stealth, lock picking and others, across up to 24 character levels. Along the way, players talk to other survivors and uncover emails, documents and news articles to piece together the truth behind 'The Event'. Choices have consequences and missions can be approached in multiple ways. "We set out to create an experience that had depth, that was immersive, but would be accessible to pick up at any time," said Kyri Patarou, writer of Post Brutal. "Our independent team of two has taken the post apocalypse into a new direction and we want players to experience it their way." Post Brutal will be free to download and promises a wide range of missions, areas to explore, and achievements to earn. Optional premium upgrades including a story-based campaign with exclusive new missions, enemies, and multiple endings are also available as in-app purchases. Updates are planned to include new free content on a regular basis. Post Brutal will have a mature age rating and will be available on the App Store and Google Play from December 2nd, 2016. Hell Tap Entertainment LTD is a new development studio dedicated to pushing the boundaries of what mobile gaming can achieve. A small, but ambitious indie studio, after years of working on their first title, are pleased to finally be able to share it with players. All Material and Software (C) Copyright 2016 Hell Tap Entertainment LTD. All Rights Reserved. Apple, the Apple logo, iPhone, iPod and iPad are registered trademarks of Apple Inc. in the U.S. and/or other countries. Other trademarks and registered trademarks may be the property of their respective owners.